These 12 rolls of Scott toilet paper have no center core, thus using up all available space for maximum space for more toilet paper and reducing waste. 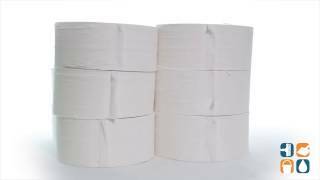 Each jumbo Scott coreless toilet paper roll has 15% more tissue than standard jumbo rolls. Each roll is 1,150 in length and 3.78" wide. Includes 12 rolls. For use in IN-SIGHT Coreless JRT Jumbo Roll Dispenser KCC 09608 (sold separately).